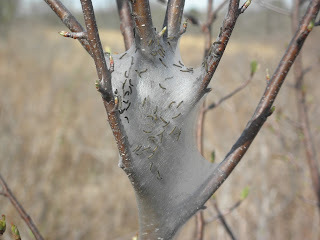 This is the time of the year that eastern tent caterpillars are active. The first sign people notice are silken tents in the forks of branches, particularly in fruit trees, including apple, chokecherry, crabapple, plum, and cherry. These tents are be small at first but will increase in size and can eventually become quite conspicuous. Eastern tent caterpillars feed on tree leaves during the day and will remain in their tents at night and during rainy weather. Eastern tent caterpillars are bluish black with yellow and a white stripe running down the top of its body. They are mostly smooth but do have a series of hairs sticking out along the sides of their bodies. They are two inches long when fully grown. Healthy, well-established trees can tolerate eastern tent caterpillar feeding. Their feeding, as well as the presence of their webs, is primarily a cosmetic problem, affecting just the trees’ appearance. However, young trees, as well as unhealthy, stressed trees, are more susceptible to feeding damage and may need to be protected. A great method to deal with eastern tent caterpillars without using pesticides is to wait until they have retreated into their tents at the end of the day or on a rainy day and then pull out the webbing, along with the caterpillars. Then bury or bag them to properly dispose of them (you could burn them if it is permitted where you live). If it is a consideration to treat these caterpillars make sure they are reasonably small, usually one inch or less. As they approach full grown size (two inches), the closer they are to finishing their feeding, making it less worthwhile to treat them. There are a variety of residual insecticides that are effective against caterpillars. Consider using a product that has a low impact on the environment, such as Bacillus thuringiensis, spinosad, or insecticidal soap. Bacillus thuringiensis is a particularly good product if the tree is flowering since it will not harm visiting honey bees and other pollinators. If you use insecticidal soap, the product needs to directly contact the insects. There is no residual activity so you may need to repeat the treatment.